Looking for new varieties that are proven garden performers? Look no further than these All-America Selections (AAS) Winners for 2019. 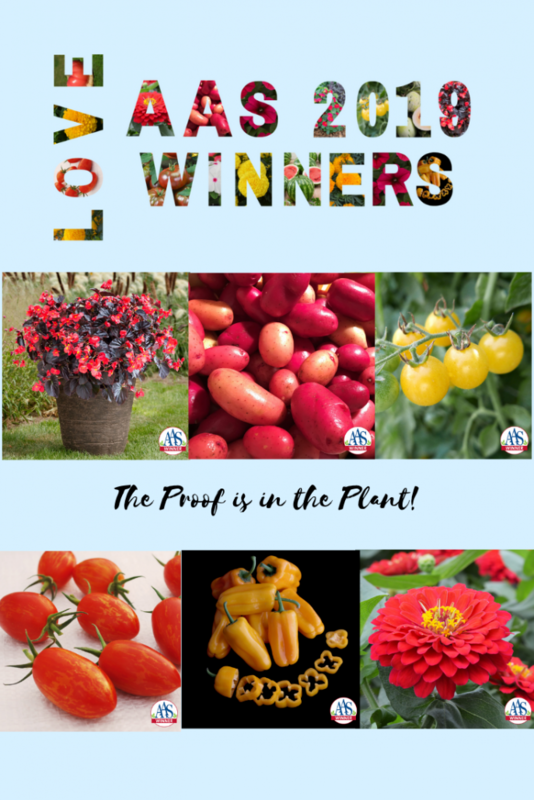 After being trialed by AAS volunteer judges in more than 35 locations all over North America, the following new AAS Winners are proven performers, perfect for your garden! AAS Winners are available as seeds and plants from mail-order catalogs, websites and your local garden center. Check here for some of the many mail-order sources for AAS Winners! A brand new begonia with uniquely colored leaves has arrived! Judges were impressed with how the deep bronze/brown color remained sharp and intense throughout the season. The color tones shine through to give a stunning garden appearance. Covered with vibrant red flowers, the compact plant retains its shape well. QUACK! There’s a new marigold in the pond! Big Duck Gold begins the season putting energy into establishing a solid, healthy plant with clean, deep-green foliage. Then, full, “plump” blooms top the 15” plants (which are slightly taller than the more compact comparison varieties) and continue blooming through the end of the season. Big Duck Orange joins sibling Big Duck Gold in a new marigold series that continues blooming throughout the season growing vigorously creating well-branched plants with clean, deep-green foliage. Fully double and beautifully colored 4-inch orange blooms “pop” on the 15” plants and continue blooming through the end of the season. Big Duck Yellow is another marigold color in the series that has great heat and disease tolerance. The large 4” flowers are well-supported on sturdy, compact, uniformly even plants that consistently produced more flowers for a longer period than the comparisons. Orange SilverWave is an exotic melon bred in South Korea with an extremely sweet, orange flesh and unique rind color. Many foodie gardeners are looking to grow something different to “Wow!” their guests and this melon will do just that! The attractive 5” oval melons grow on vigorous producing up to six fruits per vine. Exciting news! The last nasturtium AAS Winner was back in the early days, in the 1930’s. Now it’s time to introduce a wonderful rose colored nasturtium perfect for today’s gardens. Baby Rose is a petite-flowered, mounding variety with healthy, dark foliage ideal for containers and small space gardens. A unique snacking pepper with four lobes like a larger bell pepper, only smaller. Not only are the 3 inch fruits deliciously sweet with nice thick walls but the plants are vigorous growers (up to 36 inches tall and 15 inches wide) that don’t need to be staked because they’ve been bred to have a strong bushy habit. This newest color of the popular Wave® petunias had the AAS judges coming up with an array of ways to describe the unique carmine rose color: “Fabulous,” “Stunning,” “Intense,” “Vibrant,” “Lively,” “Great color,” “Bright,” “Non-fading,” “Outstanding,” “My favorite!” You get the picture; the judges loved this entry! The first AAS Winning potato from seed! The benefits of growing from seed are many: sterile seed eliminates the potential for introducing disease to the garden and the seeds can be stored longer than potato tubers. Potato Clancy produces compact dark green plants with blue flowers. Resulting spuds range from red to rose skin tones with creamy white interiors. And now there are six! This variety is the sixth color variation in the popular Chef’s Choice tomato series. Chef’s Choice Black is a beefsteak type tomato with a dark green/brown/black hue. AAS Judges reported vigorous, healthy plants with clean and uniform fruits that were early to set and had a meaty interior with great flavor. Similar to the Goldilocks story, this adorable newcomer is not as small as a currant tomato and not as large as a cherry tomato, but is a “just right” in-between size. The fruits produced are super sweet pale white to pale yellow round fruits less than 1 inch in size and weigh about 1/2 oz. A beautiful new pink tomato in the “Mountain” series has excellent flavor and a very robust disease package of verticillium, fusarium, nematodes, and Late Blight. Gardeners will enjoy a generous harvest of large, beefsteak tomatoes weighing 12-14 oz. that have a great tomato taste with just the right balance of acid and sugar. Red Torch is a striped oblong tomato with 1.5” long fruits that weigh about 1.5 ounces. This hybrid is a very prolific early-season producer. The combination of excellent flavor, great texture, and high yields make this hybrid better than other varieties in the trendy niche market of striped tomatoes. Sparky is one of the few X-tended Shelf Life (XSL) cherry tomatoes available to home gardeners. Sparky brags about being early to mature, prolific and very flavorful. Very sweet fruits have an average Brix score of 8.5. Round fruits weigh 1 ounce and are 1inch in diameter. Cal Sweet Bush is an example of how ongoing breeding efforts result in a new and better product. This is a true short internode watermelon. These watermelons have compact, bushy vines that grow only 14-18” long and still provide enough foliage cover to protect the fruits. Each plant yields 2-3 fruits weighing 10 -12 pounds. The hearty Mega Bloom vinca series has been bred to withstand heat and humidity without succumbing to disease. Polka Dot excels in that area plus sports huge showy flowers on full, vigorous plants that stay tidy and compact. Each large bloom (3-4”) has attractive overlapping petals in snowy white with a bright pink eye. This beautiful Winner is named after the famous Holi Festival of Colors because of its vibrant color! AAS Judges deemed this an “excellent flower” because of the bright solid color, size, and the number of blooms as well as the disease resistance, which was superior to the comparisons.